The regulation of the immediate-early gene c-fos serves as a paradigm for signal-activated gene induction. Lysophosphatidic acid is a potent serum-borne mitogen able to induce c-fos. Analysing the signalling events following stimulation of mouse embryonic stem cells with serum and lysophosphatidic acid, we show that the extracellular signal-regulated kinase (ERK) pathway is involved in mediating c-fos induction. We demonstrate that the ERK-activated kinase MSK1 is required for full c-fos promoter activation, as well as for the phosphorylation of cAMP-responsive element (CRE) binding proteins. We propose that MSK1 contributes to ERK-mediated c-fos promoter activation by targeting CRE binding proteins. These results show that MSK1 is an important ERK-activated mediator of mitogen-stimulated c-fos induction. In addition, they indicate that MSK1 could act through CRE binding proteins to achieve c-fos promoter activation. Thus, they further our understanding of the complex regulation of the model immediate-early gene c-fos. Lysophosphatidic acid (LPA) is an intercellular mediator involved in inflammation and wound healing . It is released by activated platelets and leukocytes, and is one of the most potent mitogens found in serum. LPA acts through G-protein-coupled receptors to activate a number of intracellular signalling pathways including mitogen-activated protein (MAP) kinase cascades and Rho signalling. This leads to cellular responses such as proliferation, differentiation and suppression of apoptosis. One way in which these effects are mediated is induction of immediate-early genes such as c-fos. The c-fos promoter has been extensively studied as a model for signal-activated gene induction [2, 3]. It contains several regulatory elements, namely a serum response element (SRE), a cAMP-responsive element (CRE), a sis-inducible element, and an AP-1-like site, which serve to integrate input from a host of signalling pathways. These promoter elements are strongly interdependent. Mutation of one of them inhibits c-fos activation through any of the other elements, suggesting that they are connected by protein complexes . The c-fos SRE is constitutively occupied by the transcription factor serum response factor (SRF) . Its presence allows members of the Ets family ternary complex factors (TCFs) to bind to the SRE . A well understood mechanism underlying c-fos induction is phosphorylation of TCFs by MAP kinases, leading to transactivation . SRF bound to SRE reporter genes can also be activated independently of TCFs by at least two signalling pathways, one involving the small GTPase Rho, while the other is regulated by phosphatidylinositol 3-kinase [7, 8]. However, how these pathways contribute to the control of the endogenous c-fos gene is not clear. In addition, SRF is phosphorylated in a signal-regulated manner by several kinases, including MAP kinase-activated protein kinase-1 (MAPKAP-K1, also called RSK) and MAPKAP-K2 [9, 10]. SRF phosphorylation has been correlated with enhanced DNA binding [9, 11], but so far there is no direct evidence for a functional role of SRF phosphorylation. The CRE is bound by CRE binding protein family members, including CREB and ATF1. Upon phosphorylation, they recruit the co-activator CREB binding protein (CBP), thus effecting transactivation. Phosphorylation of CREB can be induced by several distinct pathways. For instance, in response to elevated intracellular cAMP levels, CREB is phosphorylated by protein kinase A. Growth factors and cellular stresses induce CREB phosphorylation by activating downstream targets of the classical extracellular signal-regulated kinase (ERK) pathway and the stress-activated p38 pathway, respectively . 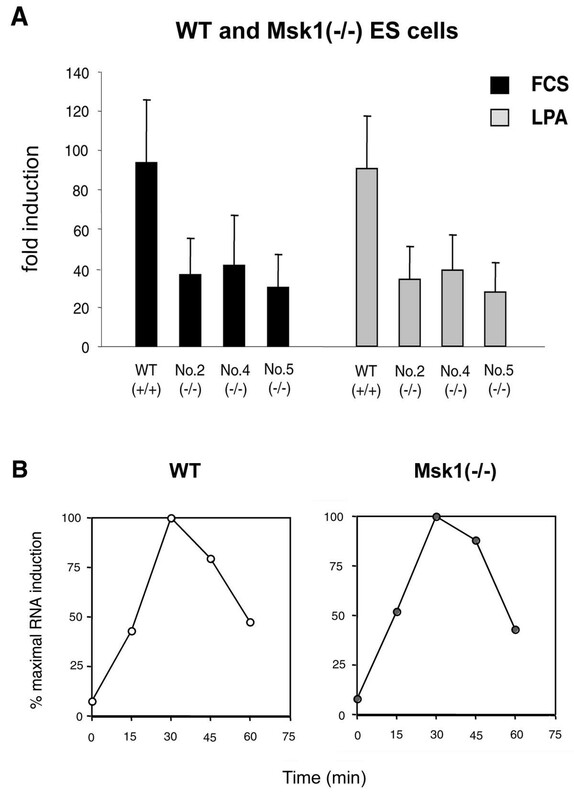 MAPKAP-K1b/RSK2 was initially thought to be the major growth factor-regulated CREB kinase [13, 14], but recent evidence indicates that mitogen- and stress-activated kinases (MSKs) play this role [15–17]. Signal-dependent changes in chromatin structure as part of the nucleosomal response constitute an additional level of regulation . Stimulation rapidly induces histone phosphorylation and acetylation at the loci of immediate-early genes . Histone kinase activity has been shown for both MAPKAP-K1b/RSK2 and MSK1, while CBP possesses histone acetyltransferase activity [20–22]. Therefore, these molecules might play a dual role by contributing to c-fos induction at the level of chromatin remodeling as well as promoter activation. Transfection experiments have shown that LPA targets the SRE to activate the c-fos promoter. This was proposed to occur through a Rho-dependent pathway, independently of TCFs and MAP kinases . However, a more recent study concluded that induction of the endogenous c-fos gene by LPA requires the ERK pathway, but not Rho signalling . In addition, some c-fos induction by LPA remains in cells that lack SRF and thereby signalling to the SRE , indicating that other promoter elements may contribute to c-fos induction. Here, we analyse the signalling events leading from LPA stimulation to c-fos promoter activation. We confirm that regulation of the endogenous c-fos gene involves the ERK pathway and provide direct genetic evidence for a role of MSK1 in this process. Furthermore, we suggest phosphorylation of CRE binding proteins by MSK1 as a mechanism to link the ERK pathway to the c-fos promoter, thus allowing for SRF-independent c-fos induction. Serum-starved wild type (WT) mouse embryonic stem (ES) cells were stimulated with fetal calf serum (FCS) or LPA. Activation of the major MAP kinases ERK1/ERK2, JNK1/JNK2, and p38 was determined by immunoblotting with phospho-specific antibodies against their T-X-Y activation motifs (Figure 1). ERK1/ERK2 phosphorylation was rapidly induced by both stimuli, followed by a slow decline. Induction of JNK1/JNK2 phosphorylation showed a delayed onset and was less pronounced. Induction of p38 phosphorylation was barely detectable. MAP kinase activation in WT ES cells. WT ES cells were serum-starved for 36 h and stimulated with 15% FCS or 20 μM LPA for the times indicated. Cell lysates were electrophoresed and immunoblotted with antibodies recognising the phosphorylated forms of ERK1/ERK2, JNK1/JNK2 and p38 (p-ERK1/2, p-JNK1/2 and p-p38). Antibodies against total ERK1/ERK2 and p38 served as loading controls. Given its rapid activation, the ERK pathway could be involved in c-fos induction, which causes an increase of c-fos mRNA within 10 min of serum stimulation . To test this, WT ES cells were stimulated with FCS and LPA in the absence or presence of PD98059, an inhibitor of the ERK pathway . Accumulation of c-fos mRNA after 30 min of stimulation was measured by quantitative RT-PCR (Figure 2a). Induction of c-fos by both stimuli was reduced in the presence of PD98059. Figure 2b shows that PD98059 inhibited ERK activation. It should be noted, however, that PD98059 did not completely block ERK activation in this cell type (data not shown), so that our data may in fact underestimate the importance of the ERK pathway. To further corroborate that the ERK pathway mediates c-fos induction by FCS and LPA, Ro318220 was used to inhibit MAPKAP-K1/RSK and MSK1 [15, 26], two downstream targets of ERK1/ERK2 (Figure 2c). Induction of c-fos by both stimuli was strongly inhibited by Ro318220. Therefore, the ERK pathway is involved in c-fos induction by FCS and LPA in mouse ES cells. In addition, the inhibitory effect of Ro318220 suggests that signalling through the ERK pathway involves MAPKAP-K1 or MSK1, or both kinases. Induction of c- fos in WT ES cells. A – Cells were serum-starved for 36 h and incubated with 25 μM PD98059 during the last hour of starvation where indicated. 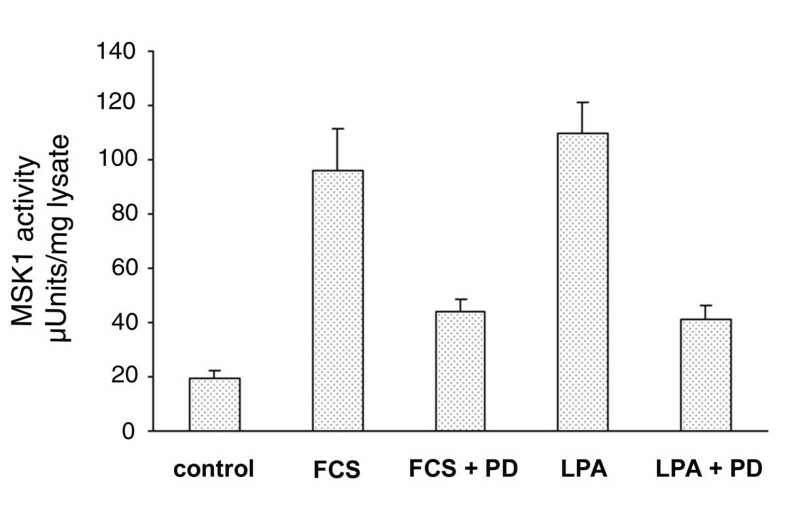 Cells were stimulated with 15% FCS or 20 μM LPA for 30 min, followed by quantitative RT-PCR. Based on relative mRNA levels, fold inductions of c-fos were calculated from three independent experiments (FCS: 82.1 ± 27.6, FCS + PD: 43.8 ± 25.7, LPA: 63.1 ± 43.5, LPA + PD: 39.7 ± 25.2). To eliminate experiment-to-experiment variations in the induction levels and to more clearly show the effect of PD98059, induction without inhibitor was set to 100% for each individual experiment and percent c-fos induction was calculated for the samples treated with inhibitor. B – Cells were serum-starved and treated as in A. Stimulation was done for 10 min and ERK1/ERK2 phosphorylation was analysed as in Figure 1. C – Cells were serum-starved and treated as in A, except that PD98059 was replaced by 5 μM Ro318220. Fold inductions from three independent experiments were FCS: 76.2 ± 42.0, FCS + Ro: 15.7 ± 10.5, LPA: 67.9 ± 20.3, LPA + Ro: 2.8 ± 1.9. Representation of the data as in A. To examine the potential function of MSK1 in c-fos induction, we first tested whether it can be activated by FCS and LPA in mouse ES cells. Either stimulus activated MSK1 in serum-starved wild type mouse ES cells, as judged by immunoprecipitation kinase assays (Figure 3). This activation was inhibited by PD98059, indicating that it required the ERK pathway. MSK1 activation in WT ES cells. WT ES cells were serum-starved for 8 h and incubated with 25 μM PD98059 during the last hour of starvation where indicated. Cells were stimulated with 15% FCS or 20 μM LPA for 10 min and MSK1 activity was determined by immunoprecipitation kinase assays. Error bars represent S.E.M. of four points. Msk1(-/-) ES cells  allowed direct assessment of the role of MSK1 in c-fos induction. Figure 4a shows that c-fos induction as measured by quantitative RT-PCR was reduced by at least 50% for both stimuli in three different Msk1(-/-) ES cell lines. This was confirmed by RNase protection assays (data not shown). The reduced c-fos induction at 30 min of stimulation could be due to a weaker promoter activation or due to a delayed response. To distinguish between these explanations, induction kinetics of c-fos in wild type and Msk1(-/-) ES cells were measured by semi-quantitative RT-PCR (Figure 4b). The time-course of c-fos induction by LPA in Msk1(-/-) ES cells was identical to that in wild type cells, excluding that disruption of the msk1 gene leads to a delayed c-fos induction. Hence, our data constitute direct genetic evidence that MSK1 is required for the activation of the c-fos promoter. Induction of c- fos in WT and Msk1(-/-) ES cells. A – WT ES cells and three different Msk1(-/-) ES cell lines (No. 2, No. 4 and No. 5) were serum-starved for 24 h and stimulated with 15% FCS or 20 μM LPA for 30 min, followed by quantitative RT-PCR. Based on relative mRNA levels, fold inductions were calculated from five independent experiments. B – WT and Msk1(-/-) ES cells were serum-starved overnight and stimulated with 20 μM LPA for the times indicated. C-fos mRNA was amplified by semi-quantitative RT-PCR. PCR products were separated on agarose gels and stained with ethidium bromide (EtBr). EtBr intensities were used to calculate c-fos induction. One mechanism of ERK-mediated c-fos induction by MSK1 could be phosphorylation of CREB bound to the CRE of the c-fos promoter. We therefore tested whether FCS or LPA could induce CREB phosphorylation in ES cells in an MSK1-dependent manner. In wild type ES cells, both stimuli induced phosphorylation of CREB and the closely related transcription factor ATF1 on serine 133 and serine 63, respectively (Figure 5). In contrast, this phosphorylation was greatly reduced in ES cells lacking MSK1, despite normal ERK activation in these cells. CREB and ATF1 expression has previously been shown to be unperturbed in Msk1(-/-) ES cells . Hence, MSK1 is required for the phosphorylation of the CRE binding proteins CREB and ATF1 after stimulation with FCS and LPA. CREB activation in WT and Msk1(-/-) ES cells. WT and Msk1(-/-) ES cells were serum-starved overnight and stimulated with 15% FCS (A) or 20 μM LPA (B) for the times indicated. Cell lysates were electrophoresed and immunoblotted with antibodies against the phosphorylated forms of CREB/ATF1 and ERK1/ERK2 (p-CREB, p-ATF1, p-ERK1/2). An antibody against total ERK1/ERK2 served as loading control. SRF is known to be required for c-fos induction through the ERK pathway, with TCF phosphorylation providing the link between ERK1/ERK2 and SRF . Only a small induction remains in the absence of SRF . ERK-dependent CRE activation through CREB phosphorylation by MSK1 could provide a mechanism for this residual induction. If this were the case, the residual induction seen in Srf(-/-) cells should still be sensitive to inhibition of the ERK pathway. To test this, Srf(-/-) ES cells  were used to measure c-fos induction in the absence or presence of PD98059 or Ro318220 (Figure 6). As observed before, c-fos induction was drastically reduced in these cells (data not shown). The residual activation elicited by LPA (about five fold as compared to more than 60 fold in wild type cells) was too small to reliably measure the effects of PD98059 and Ro318220. However, the residual response to FCS was sensitive to inhibition of the ERK pathway, showing that TCF phosphorylation is not the only mechanism by which this pathway contributes to c-fos induction. Therefore, downstream targets of ERK1/ERK2 can activate the c-fos promoter in the absence of SRF. MSK1 might be such a downstream target, linking the ERK pathway to the c-fos promoter by CREB phosphorylation and subsequent CRE activation. Induction of c- fos in Srf(-/-) ES cells. Cells were serum-starved, treated with PD98059 and Ro318220 as in Figure 2. Cells were stimulated with 15% FCS for 30 min, followed by quantitative RT-PCR. Fold inductions from three independent experiments with each inhibitor were FCS: 26.5 ± 1.8, FCS + PD: 15.6 ± 6.0 and FCS: 16.0 ± 14.3, FCS + Ro: 1.8 ± 1.2. Representation of the data as Figure 2. In this study, we show that the ERK pathway is involved in LPA signalling to the c-fos promoter in mouse ES cells. We demonstrate that MSK1 is necessary for full c-fos promoter activation as well as for phosphorylation of CRE binding proteins, and we provide evidence for SRF-independent c-fos induction through the ERK pathway. The activation profiles of MAP kinases show ERK1/ERK2 and JNK1/JNK2 activation by serum and LPA, while only a slight p38 activation could be detected (Figure 1). These results are consistent with previous reports for the serum stimulation of ES cells . Our experiments do not address the role of JNK1/JNK2 in c-fos induction. However, since activation of a chromosomal SRE reporter gene by LPA has been found to require JNK-mediated histone hyperacetylation , JNK1/JNK2 may be involved in c-fos regulation at the level of chromatin remodelling. The kinetics of ERK1/ERK2 activation and c-fos induction, as well as the reduced c-fos induction in the presence of the ERK pathway inhibitors PD98059 and Ro318220 are consistent with a role of ERK1/ERK2 in c-fos induction by serum and LPA (Figure 1 and 2). A major mechanism by which ERK1/ERK2 mediate c-fos induction, is phosphorylation of TCFs . However, even though TCFs can bind the c-fos SRE only in the presence of SRF, the knockout of SRF does not completely abolish c-fos induction . This suggests a role for other c-fos promoter elements. 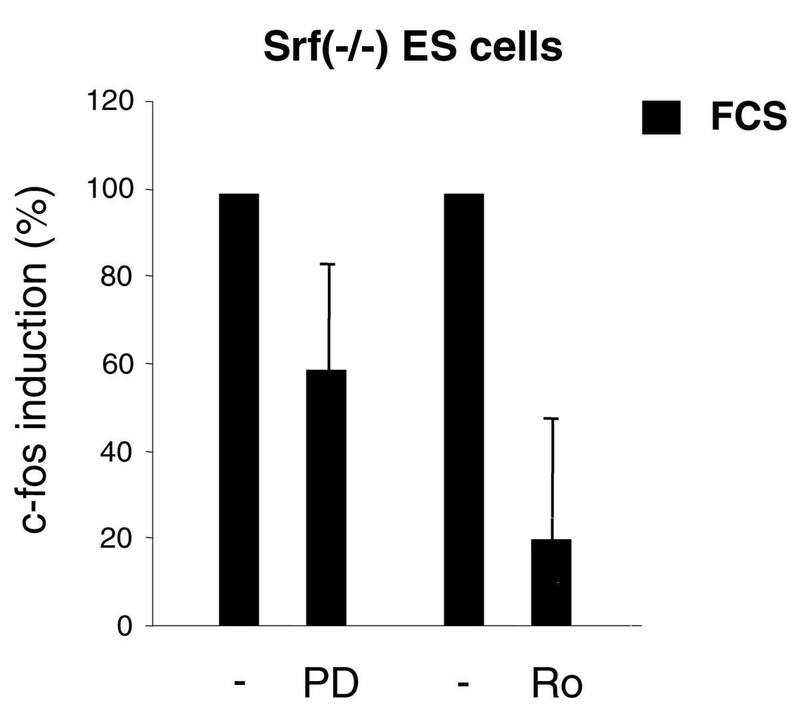 We show that in Srf(-/-) ES cells, the residual response to serum is still PD98059- and Ro318220-sensitive (Figure 6), indicating SRF-independent signalling through the ERK cascade. It should be noted, however, that data with Ro318220 have to be treated with caution as it inhibits several kinases . A possible mechanism for the residual c-fos induction in Srf(-/-) ES cells is activation of CREB bound to the c-fos CRE. 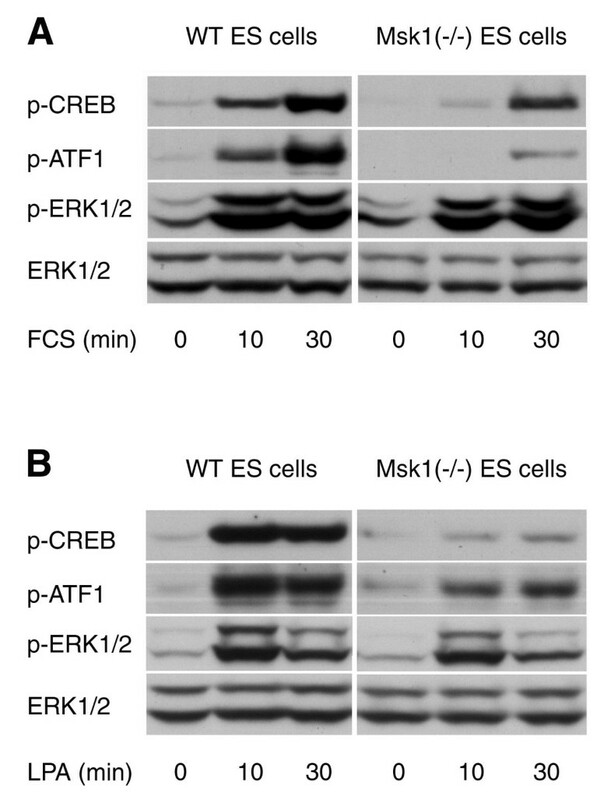 Phosphorylation of CREB leading to transactivation has been shown to occur downstream of ERK1/ERK2 in response to mitogenic stimuli in a variety of cell types . To examine a role for MSK1 in this process, we used ES cells lacking MSK1 . 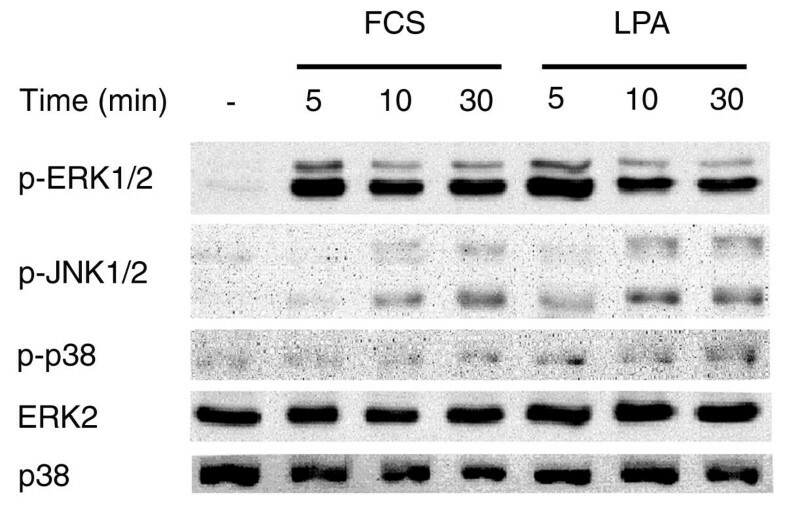 Induction of c-fos in these cells was reduced by more than 50% as judged by quantitative RT-PCR as well as RNase protection (Figure 4 and unpublished results). Transfection of dominant negative CREB into fibroblasts has been shown to reduce c-fos induction to a similar extent . Consistent with these results, we found that serum and LPA induce CREB phosphorylation in wild type cells, and that this is greatly reduced in Msk1(-/-) ES cells (Figure 5). Some CREB phosphorylation remains in the absence of MSK1, indicating that another CREB kinase exists in these cells. As MSK2 activity is undetectable in ES cells (unpublished results), the identity of this kinase remains unclear. Similarly, an undefined ERK-regulated CREB kinase distinct from MSK1 and MSK2 exists in fibroblasts . The interpretation of some of the residual c-fos induction in Srf(-/-) ES cells being due to CREB phosphorylation implies that the CRE is able to mediate c-fos activation in the absence of SRF. In the presence of SRF, CRE activation by mitogenic stimuli appears to be insufficient for c-fos activation, but requires co-operation of CREB and SRF . Possibly, this requirement is relieved in cells lacking SRF. The reduction of c-fos induction by more than 50% in Msk1(-/-) ES cells being completely mediated by the CRE seems at odds with the 60–70% reduction seen in Srf(-/-) ES cells , where the effect should be due to a nonfunctional SRE. This may reflect interactions between the different promoter elements , with a lack of transactivation at the CRE reducing the effectiveness of the SRE. In addition, it may indicate multiple roles for MSK1. Another potential function for MSK1 is histone phosphorylation as part of the nucleosomal response . MSK1 could therefore play a dual role by controlling c-fos at the level of chromatin remodelling as well as promoter activation. It was, however, not possible to examine this in ES cells due to the high level of mitosis-related histone phosphorylation in these cells that never become truly quiescent . Also, to more directly evaluate the role of the CRE in c-fos regulation, it would be helpful to analyse the activation of reporter genes driven by a minimal CRE, the wild type c-fos promoter and mutant derivatives of the c-fos promoter in which particular promoter elements are inactivated. However, we failed to establish these assays in ES cells as we were unable to efficiently activate exogenously added reporter constructs. Besides MSK1, other kinases could act in a similar fashion. MAPKAP-K1/RSK also lies downstream of ERK1/ERK2, and it has been suggested to phosphorylate CREB , but see [15–17], and histone H3 , but see . However, in MAPKAP-K1b/RSK2-deficient cells derived from Coffin-Lowry patients, serum-induced CREB phosphorylation and c-fos induction was normal . This argues against a role of MAPKAP-K1/RSK in mediating the response to serum and also to LPA, which is a serum constituent. Our results show that MSK1 is an important ERK-activated mediator of mitogen-induced c-fos activation. In addition, they indicate that MSK1 may effect activation of the c-fos promoter by phosphorylating CRE binding proteins. To further delineate the mechanisms leading to immediate-early gene activation, the respective functions of the CREB kinase and the histone kinase activity of MSK isoforms need clarification. Mouse embryonic stem cells lacking SRF or MSK1 have been described previously [16, 27]. Unless indicated otherwise, the knockout cell lines used were E100 Srf(-/-) and Msk1(-/-) No.4. Cells were cultured as described . For stimulation experiments followed by quantitative RT-PCR, 105 cells were seeded on 3.5 cm gelatinised tissue culture plates, grown in complete medium for 24 h and incubated in serum-free medium as indicated in the figures. For most other experiments, cells were grown to confluence in complete medium, followed by incubation in serum-free medium as indicated in the figures. Cells were stimulated with fetal calf serum (Life Technologies) or LPA (Sigma) at final concentrations of 15% (v/v) and 20 μM, respectively. PD98059 and Ro318220 (Calbiochem) were used at final concentrations of 25 μM and 5 μM, respectively. For analysis of MAP kinase and CREB phosphorylation, cells were lysed directly into SDS sample buffer , run on polyacrylamide gels and transferred onto nitrocellulose. Antibodies recognising phosphorylated ERK1/ERK2 (Thr202/Tyr204), JNK1/JNK2 (Thr183/Tyr185), p38 (Thr180/Tyr182), total ERK1/ERK2 or total p38 were from New England Biolabs. The antibody that recognises phospho-CREB (Ser133) and phospho-ATF1 (Ser63) was from Upstate. HRP-conjugated secondary antibodies were from Pierce, and detection was performed using the enhanced chemiluminescence reagent from Amersham. For quantitative RT-PCR, total RNA was isolated using the RNeasy kit (Qiagen) and treated with 10 U DNase I (Boehringer). 1 μg RNA was converted to cDNA using oligo-(dT)15 primers (MWG Biotech) and 200 U M-MLV Reverse Transcriptase (Promega). 1/50 of this reaction was included in each 10 μl PCR reaction. Quantitative PCR, data acquisition and calculation of relative mRNA levels was done as described . Primers: c-fos forward CCTGCCCCTTCTCAACGAC, c-fos reverse GCTCCACGTTGCTGATGCT, hprt forward GCCTAAGATGAGCGCAAGTTG, hprt reverse TACTAGGCAGATGGCCAAAGG. For semi-quantitative RT-PCR, RNA was isolated as above and RT-PCR was done using the Access RT-PCR System (Promega) with mouse c-fos primers from Ambion. Cell lysates were prepared as described . Protein concentrations of the lysates were determined by Bradford assay. Immunoprecipitation kinase assays were carried out as described  using an antibody that recognises residues 384–402 of MSK1 . MSK1 was assayed after immunoprecipitation from 1 mg of cell lysate pre-cleared with protein G sepharose. One unit of activity was the amount that catalysed the phosphorylation of 1 nmole of the substrate GST-CREB in 1 min. We thank members of the Nordheim lab for discussion and advice. This work was funded by the DFG and the United Kingdom Medical Research Council through grants to AN (No 120/7–4) and JSCA. AS acknowledges support by the European TMR Cell Signalling Network. SS carried out the quantitative RT-PCR measurements (Figures 2A, 2C, 4A, 6), did the MAP kinase blots (Figures 1, 2B) and drafted the manuscript. AS did the semi-quantitative RT-PCR (Figure 4B), the RNA protection assays (not shown) and the phospho-CREB blots (Figure 5). GS participated in the quantitative RT-PCR measurements. JSCA did the MSK1 activity assays (Figure 3) and participated in the phospho-CREB blots. AN initiated and supervised this study. All authors read and approved the final manuscript.